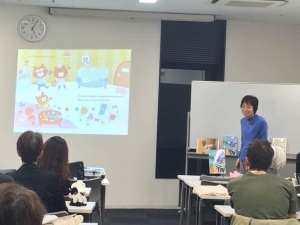 On 6th July I was invited to Jissen Women's College in Hino to give a presentation on using picture books to teach young children. All of the students were in the first year of college and studying to become nursery teachers in the future. English is only a minor part of their course but they understand the great value in using picture books in both languages. 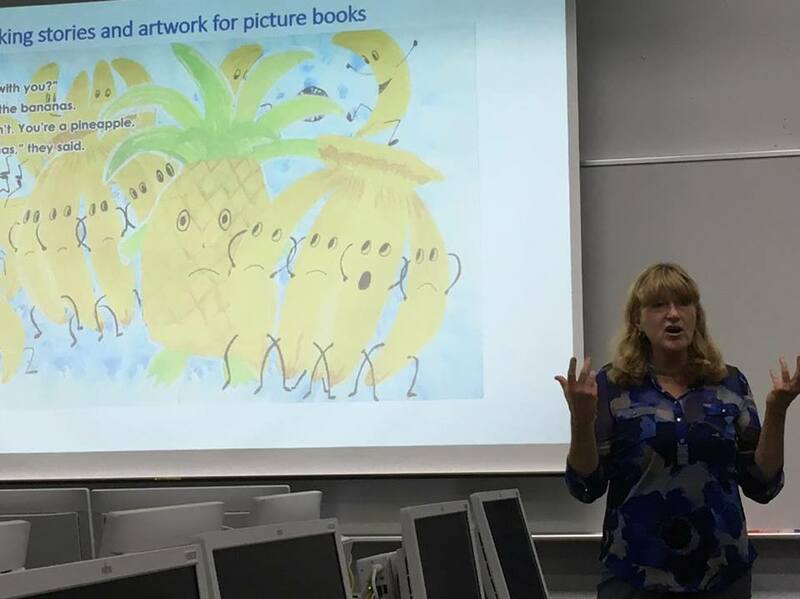 Using two of my picture books as examples (Peter the Lonely Pineapple and Lily and the Moon) I demonstrated how to read a story (with shadowing by the students) and activities related to the stories including games, songs, movement, dance, simple crafts and presentation skills. 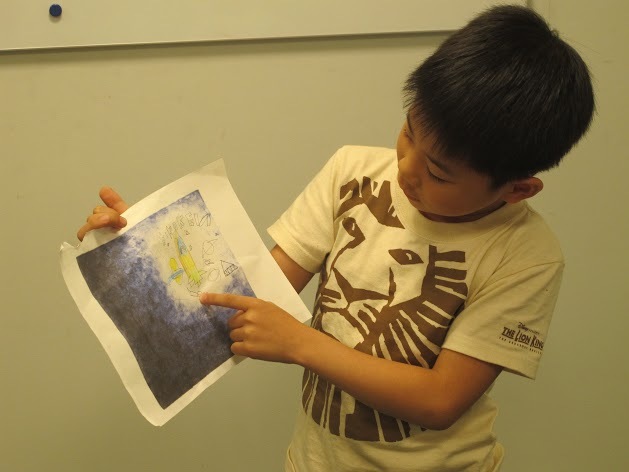 At the end each student drew what they wished to see on the moon (the pictures ranged from ice cream to shoes to lots of friends) and presented their picture to the class. 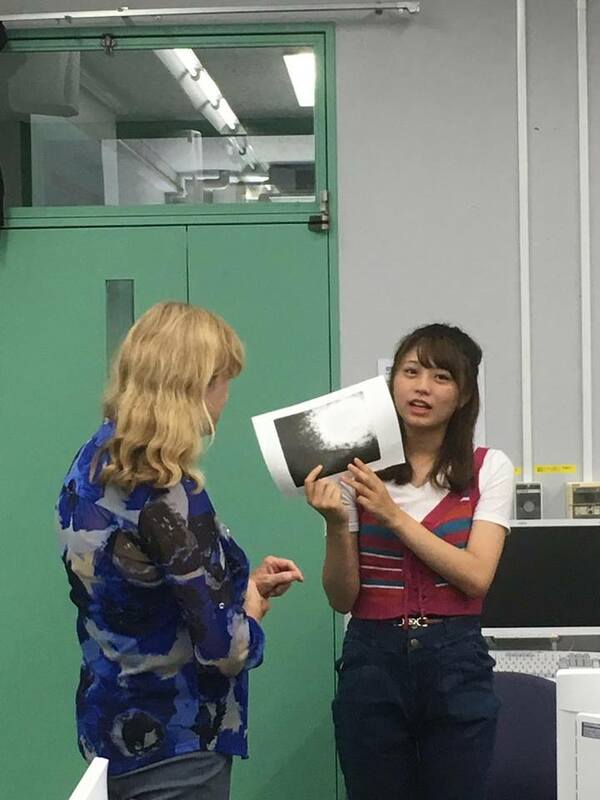 It was good timing because the next day was the Star Festival - so why not wish upon the moon as well as the stars?! 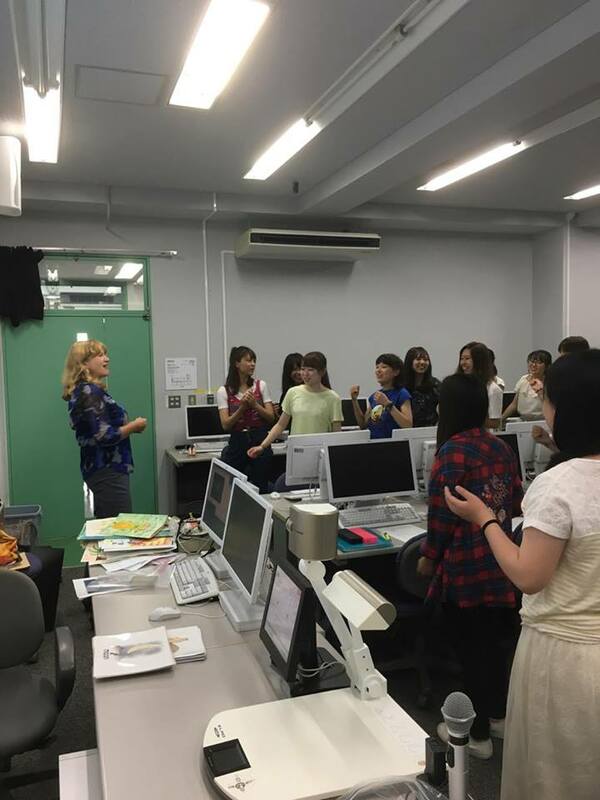 I had a great time - thank you so much Jissen students and Chiyuki-sensei for inviting me! I had the greatest pleasure of being invited again by Mari Nakamura, the owner of English Square in Kanazawa, to hold a picture book event for her students. 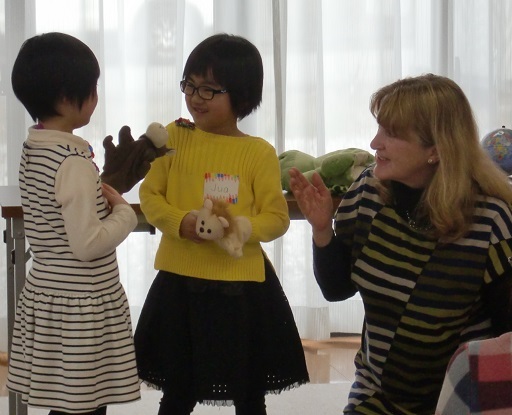 We held the event on Sunday 5th March and were happy to have warm and sunny weather that day. 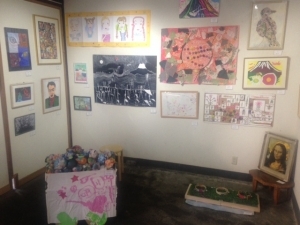 The last time I was in Kanazawa was in December and there were high winds, rain and some snow, all in one day at that time. It is so easy to get to Kanazawa from Tokyo now, with the direct shinkansen from Tokyo station. The scenery from the shinkansen window of mountains and the Japan Sea is also quite spectacular. 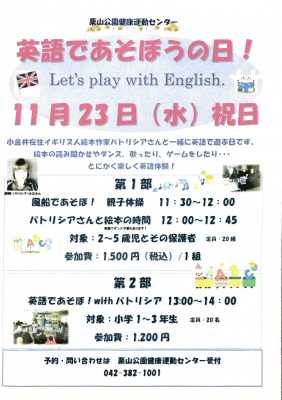 So, we held two sessions. The first group were parents and children of the younger age group and the second group were the slightly older students, from third grade upwards, and some parents. 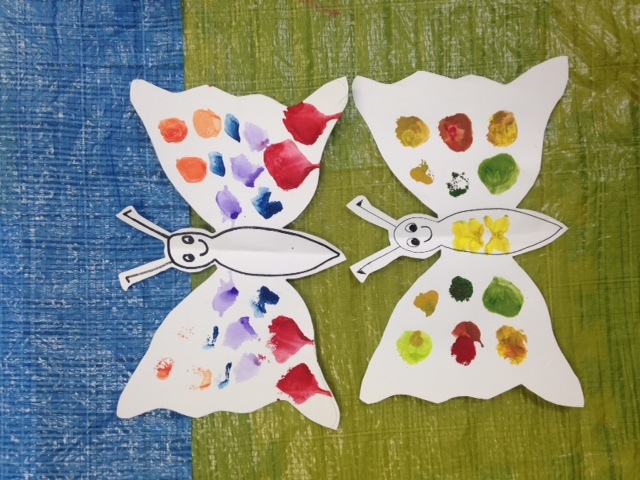 We had a great turn-out of nearly seventy children and parents in total. 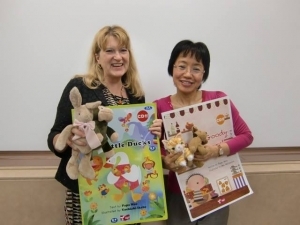 I based my sessions on the two books that Mari Nakamura and I wrote and had published by mpi Phonics last year, Can We Be Friends? 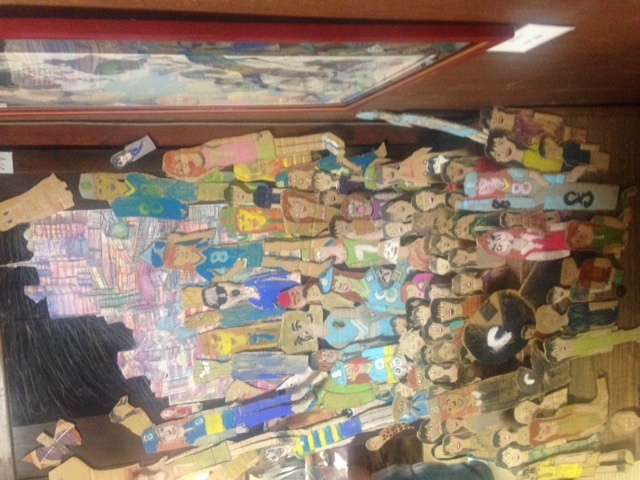 and A Trip to Grandma's House. 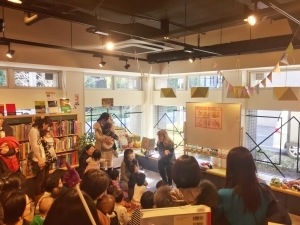 After reading the books and singing the songs connected to the stories, I introduced some creative activities where children could use their English and imagination. As one of the themes in Can We Be Friends? 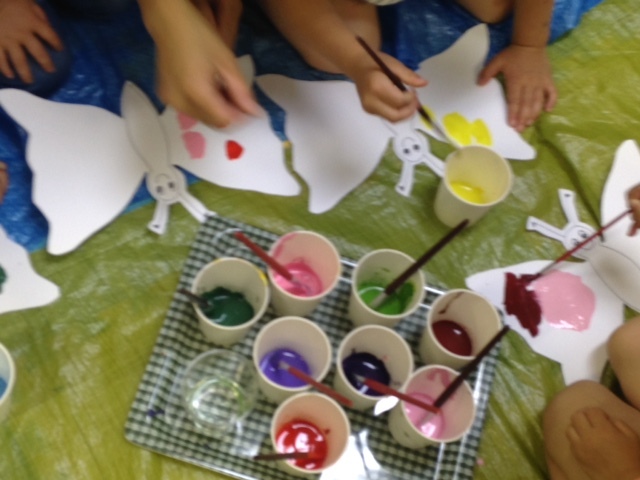 is animals and another theme is talking about what you can and can't do, we had a lot of fun with puppets. 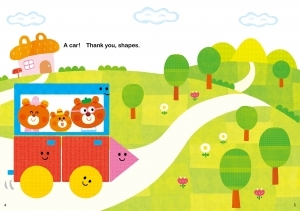 In a Trip to Grandma's House, the bear family are helped by a group of shapes - circles, triangles, rectangles and squares - to get to their grandma's house. 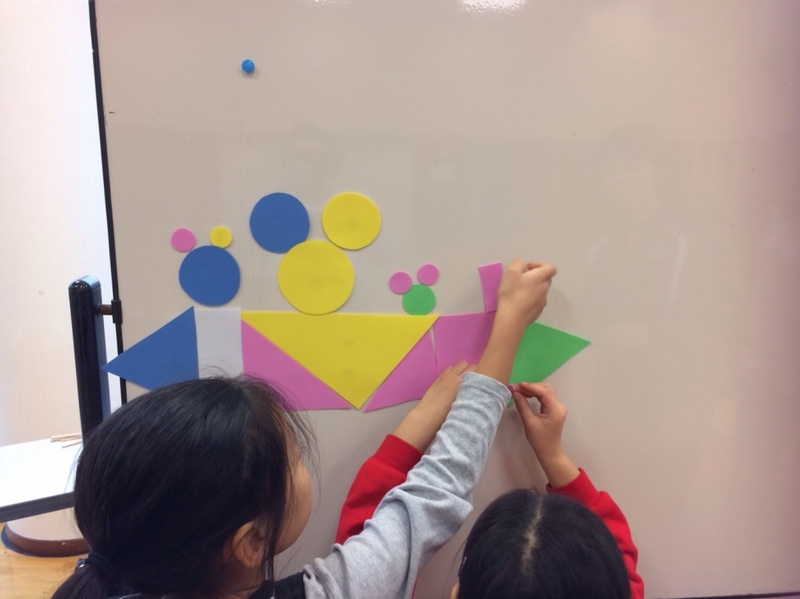 So it was really interesting to see the amazing ideas that the children came up with to create other objects from shapes to help the bears overcome various obstacles. 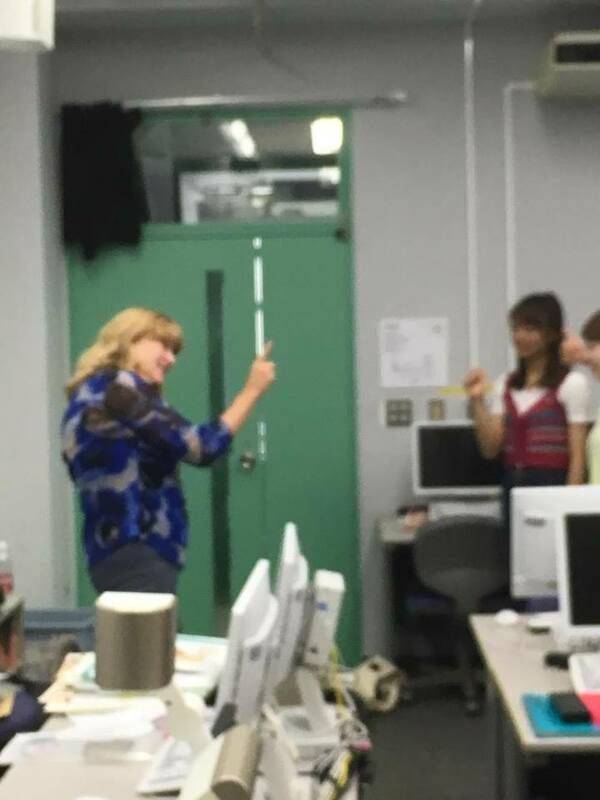 I was very impressed with Mari's students. Many students volunteered to come to the front to perform the dialogues that they had made in pairs with the puppets and all of the students worked really well in groups making interesting objects from shapes. It was fascinating how different the creative ideas were. For example, given the task of thinking of a way to get the bears quickly to England to meet the Queen, one group made a rocket, one group made a ship, one group made a submarine and two groups made airplanes, but both airplanes were designed completely differently. 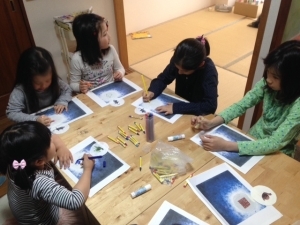 I could see how these children have had plenty of training in using imagination and English at English Square with one of the most respected teachers and teacher trainer in Japan, Mari Nakamura. There was an English picture-bookreading event and seminars for teachers held at the Meibundo Beans bookstore in Kanazawa on 10th December, 2016. I gave a book-reading of mpi Phonics English picture books and a seminar for teachers on Active Learning with Picture Books. 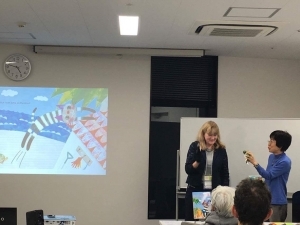 Mari Nakamura and I made a joint presentation "Nurturing Presentation Skills with Picture Books" at JALT (Japan Association of Language Teachers) National, Nagoya, on 26th November. In our presentation, sponsored by mpi Phonics and Nellie's Books, we used our two new books "Can We Be Friends?" 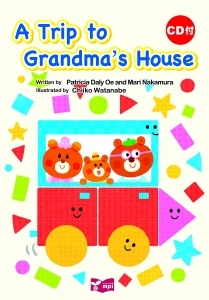 and "A Trip to Grandma's House" to show how young learners can build presentations based on picture books. In the first section on "Can We Be Friends? 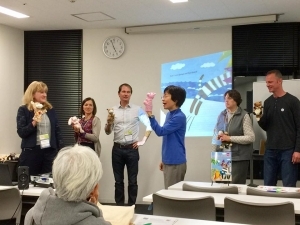 ", teachers enjoyed using puppets to make conversations about what they can or can't do. 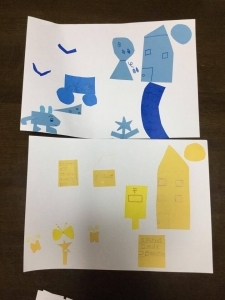 in the second part of our session, we had two teams making objects out of shapes to solve various problems which was based on the "Trip to Grandma's House" story. 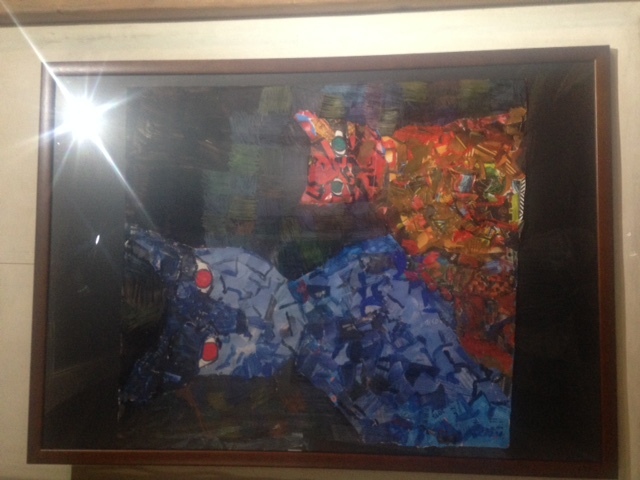 And in-between we sang the "Can We Be Friends?" 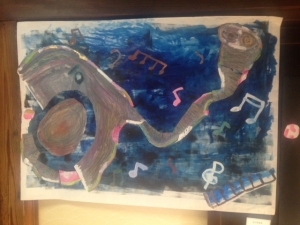 song with movement and gestures. 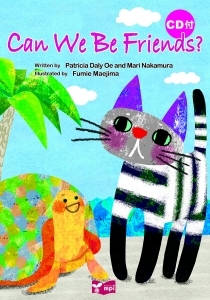 I wrote the newly released picture book for young learners "Can We Be Friends?" 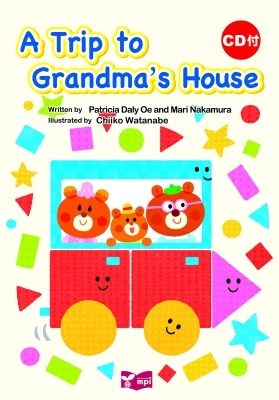 (published by mpi and illustrated by Fumie Maejima) together with Mari Nakamura. 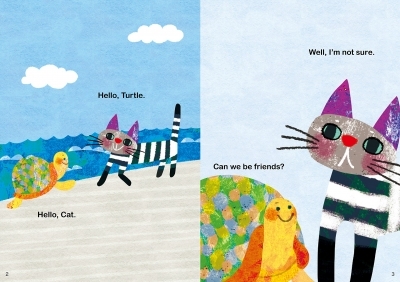 It is the story of a friendship between a cat and turtle. Can they be friends even though the things they can do are quite different? Children will enjoy trying out the actions illustrated in the book and following the friendship between the cat and turtle as it develops. 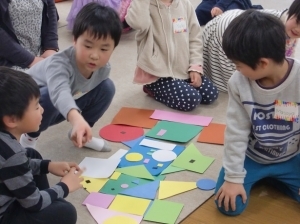 It can help young learners of English to understand how to use the "I can.." and "I can't..." structures and can be used as a basis for many classroom activities if used for teaching. 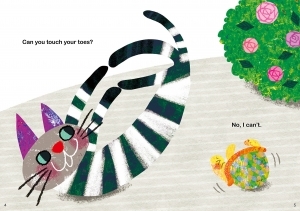 The book includes a CD with narration of the story, rhythm reading and a song.